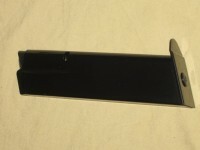 10/13 new factory Glock 21 .45 ACP Gen 4 magazine. A Magblock 10 round ..
10/15 new factory Glock G19 9MM Gen 4 magazine. 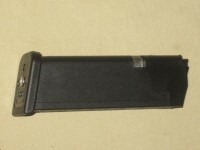 A MAGBLOCK 10 round lim..
10/15 new factory Glock 20 10mm Gen 4 magazine. A Magblock 10 round lim..
10/15 new factory Glock G22 .40 S&W Gen 4 magazine. 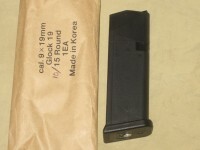 A Magblock 10 round ..
10/15 Glock 19 9mm magazine made by KCI in Korea. A MAGBLOCK 10 round limiter has been ins..
10/15 Magpul Glock 19 9mm GL-9 P-MAG. An aluminum limiter has been placed&n..
10/15 Mecgar 9mm Browning Hi Power magazine. A MAGBLOCK 10 round limiter has been installed and..
10/16 Mec-Gar 9mm CZ-75 magazine. A MAGBLOCK 10 round limiter has been installed and a 5/3..
10/17 factory FNS-9 9mm magazine. A MAGBLOCK 10 round limiter has been installed&n..
10/17 Glock 19X coyote factory magazine. 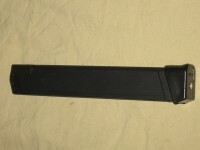 A MAGBLOCK 10 round limiter has been inst..
10/17 new factory Glock G17 9MM Gen 4 magazine. 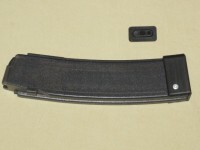 A MAGBLOCK 10 round limiter h..
10/17 KCI Korean 9mm magazine for the Glock 17. A MAGBLOCK 10 round limiter has been insta..
10/17 Magpul Glock 17 9mm GL-9 P-MAG. An aluminum limiter has been placed behind..
10/19 Mec-Gar 9mm CZ-75 magazine. A MAGBLOCK 10 round limiter has been installed and a 1/8..
10/20 Czech Scorpion Evo 9mm Magazine. A MAGBLOCK 10 round limiter has been installed and a 1/8..
10/20 Mec-Gar Beretta 92FS M9 9mm magazine. A Magblock 10 round limiter has been inserted ..
10/20 Mec-Gar Sig Sauer 226 9mm magazine. A Magblock 10 round limiter has been inserted an..
10/22 new factory Glock 22 .40 S&W Gen 4 magazine. 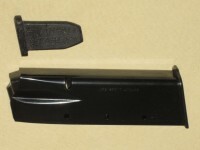 A Magblock 10 ro..
10/26 Korean Glock .45 ACP magazine. A Magblock 10 round limiter has been inserted an..
10/30 Czech Scorpion Evo 9mm Magazine. A MAGBLOCK 10 round limiter has been installed and a 1/8..
10/31 Korean Glock .40 S&W magazine for the Glock 22, 23, & 27. 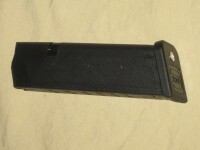 A Magblock 10..
10/33 factory Glock 9mm magazine, flat dark earth color. A Magblock 10 round limiter ..
10/33 new factory Glock gen 4 9mm magazine. A Magblock 10 round limiter has been installed..
10/33 Korean Glock 9mm mag. A Magblock 10 round limiter has been inserted and a rivet has ..
9/18 Mecgar Sig Sauer P226 9mm magazine. A Magblock 9 round limiter has been inserted..